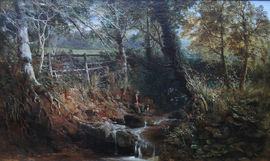 William E Jones (fl.1949-1871 ) was a Bristol landscape painter who exhibited from 1849-1871 at the Royal Academy, British Institute and Suffold Street. Member of the Bristol Academy of Arts. Paviere illustrates his "Panorama of the Thames from Richmond Hill".